Pope Francis delivers his speech during his weekly general audience in St. Peter's Square at the Vatican, Wednesday, Sept. 9, 2015. Pope Francis will deliver only four out of his 18 speeches in the U.S. in English, using his native Spanish for the vast majority of his homilies, greetings and other speaking engagements in his three-city U.S. tour, the Vatican said Tuesday. Francis has polished his English during recent trips to Asia, but the Vatican spokesman, the Rev. Federico Lombardi, said the 78-year-old Argentine pope simply finds it easier to express himself in Spanish. He said there was no symbolic significance to the pope's decision. Two of Francis' major speeches will be in English: his remarks at the White House and speech to Congress, the first ever by a pope. 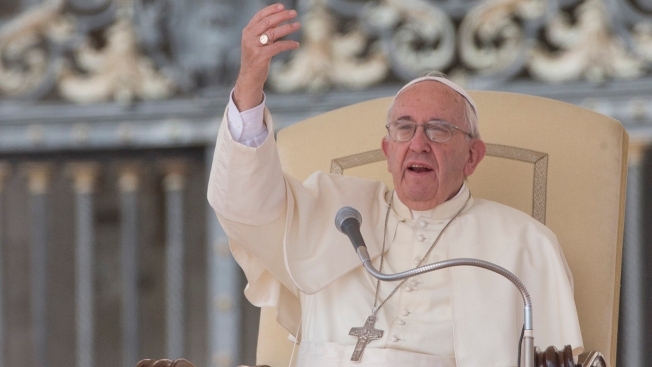 Francis will also deliver English greetings to U.N. staff and benefactors in Philadelphia. But his homilies at a canonization in Washington, his big Mass in Madison Square Garden and at the Catholic Church's world family conference in Philadelphia will be in Spanish, as will his address to the U.N.
Francis leaves Saturday for Cuba and arrives in the United States on Sept. 22 for a five-day visit. Lombardi said a meeting with Fidel Castro in Havana was "likely" but hadn't yet been scheduled. Lombardi said security would be tight on the U.S. portion of the trip, especially in New York, since Francis' arrival coincides with the U.N. General Assembly gathering of world leaders. He said Francis would only have a few limited occasions to greet the crowds from his open-sided popemobile. "Maybe these aren't long stretches like we saw in the Philippines or Sri Lanka," he said. 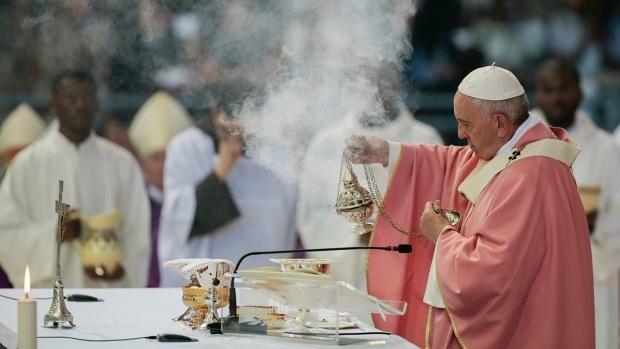 "But the pope intends to move around as he usually does." Lombardi also confirmed that Francis has never been to the U.S. or Cuba. Lombardi said Francis had once changed planes in Cuba but had never visited.